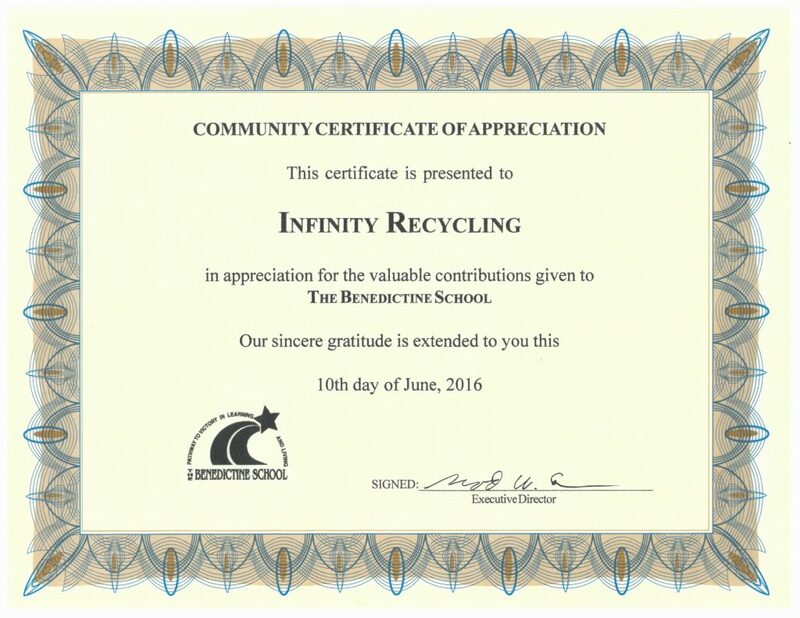 Infinity News | INFINITY RECYCLING | INC.
MARK YOUR CALENDARS! Do you have materials that are recyclable, but not accepted in our program? 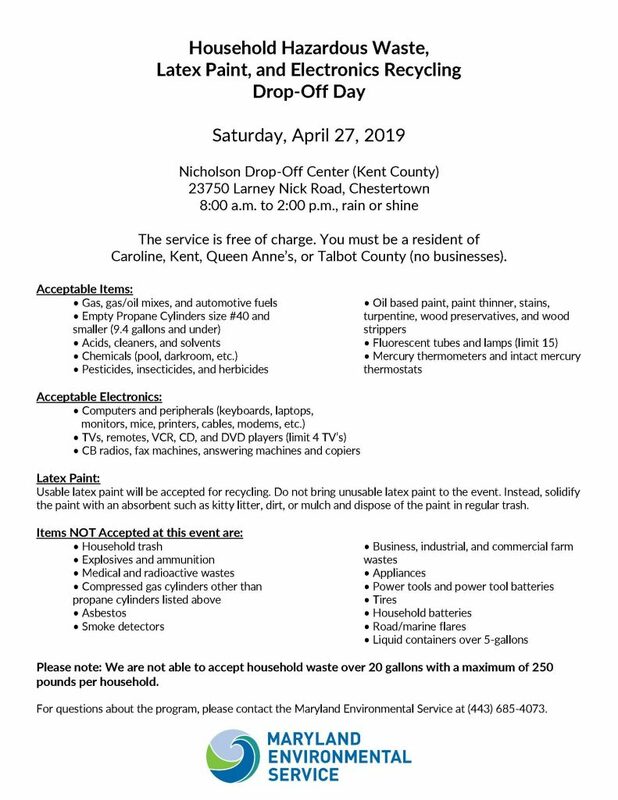 Maryland Environmental Service has a Hazardous Waste Drop-Off Day in the spring and in the fall, that moves between the counties on the Eastern Shore. The next event is on April 27, 2019 at the Nicholson Drop Off Center in Kent County. Now is the time to clean up and clean out some of those materials that we are unable to take in our recycling programs. Infinity will be closed for the holidays from Tuesday December 25th through Tuesday January 1st. Routes have been re-scheduled as follows; any route not posted will be skipped until the next regularly scheduled collection date. Pick up on Monday December 24th – Tuesday Town of Betterton, Tuesday Kent County Rural residential and Tuesday cardboard routes. Pick up on Wednesday December 26th – Tuesday Commercial and Tuesday Town of Queen Anne and Tuesday Rural Queen Anne’s County routes. Pick up on Friday December 28th – Friday Town of Chestertown residential curbside and Thursday cardboard routes. Pick up on Monday December 31st – Monday Oxford, Easton, St. Michael’s residential, Tuesday Town of Betterton, Tuesday Kent County Rural, Tuesday Town of Queen Anne residential and Tuesday Cardboard routes. 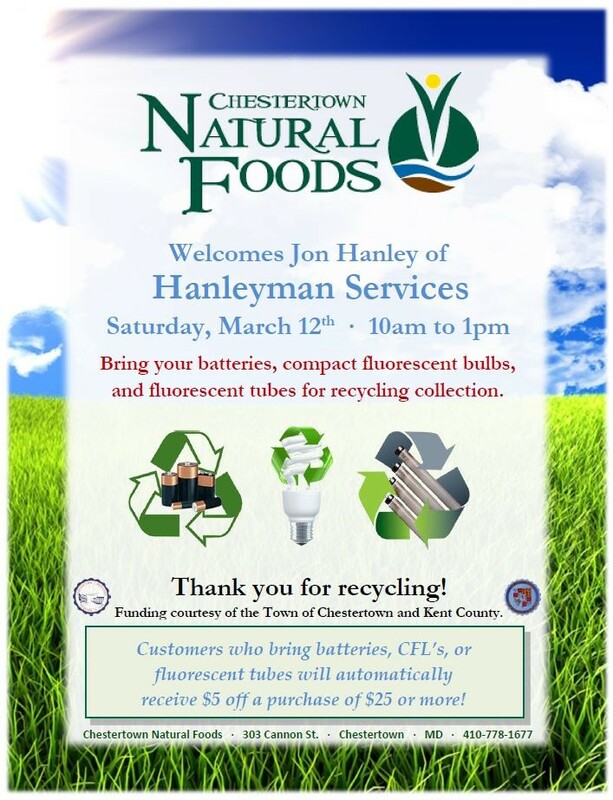 With Chestertown ending its household battery recycling program, Infinity Recycling, a local not for profit recycling organization, is willing to take up the slack. 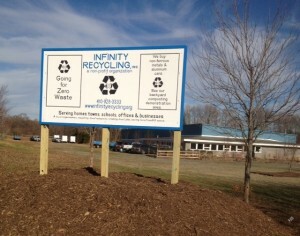 Infinity is proud to announce the official opening of its Center for Hard to Recycle Materials, or CHaRM. The CHaRM was originated by EcoCycle in Boulder, CO many years ago. The center was established to deal with materials that have been researched and found to be recycled someplace. These materials may not have a high enough value to be accepted for free, so handling and shipping costs need to be obtained from the recycler or via a targeted grant. Along with the establishment of the CHaRM, Infinity will pledge to find additional materials that can be kept out of the landfill by recycling or reusing it, trying to add one addition material each year. Infinity has found a battery recycler who will send a container for collection. The cost covers their processing, including shipping. For now Infinity will be sending 35 pound loads at a time. As the volumes grow at Infinity, larger loads may be used with the hopes that the overall costs will decrease. 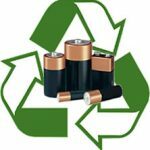 Presently the charge for accepting household batteries will be 15 cents per ounce or $2.40 per pound. Infinity also handles two other materials that traditional recyclers do not deal with. They are clothing and electronics. Neither of these requires a charge in small amounts, although there are some requirements that are stated on the website www.infinityrecycling.org. Please note that the CHaRm materials will not be accepted as part of our curbside recycling service unless stated in our instructions. Please feel free to email or call 410-928-3333. 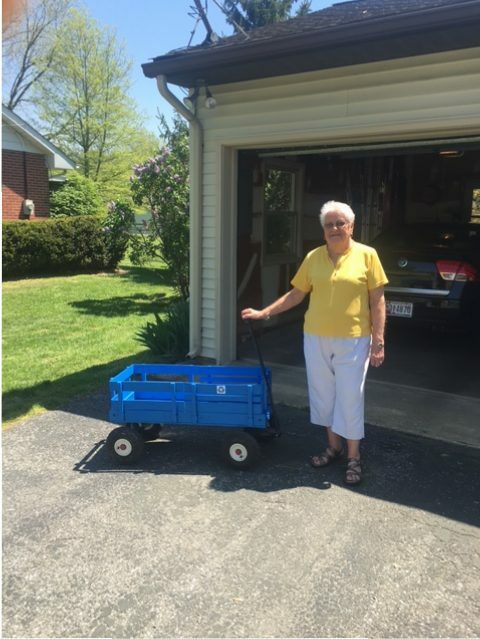 When Ms. Myrtle Boyd called and said her wagon had disappeared from her yard so she wouldn’t be able to get the recycling to the curb, Ford went to work on an old wagon he had on the farm and took it to her. Thank you Ms. Myrtle and Keep On Recyclin’! One of the things that Ford, our company president and director, likes to do is teach about recycling. 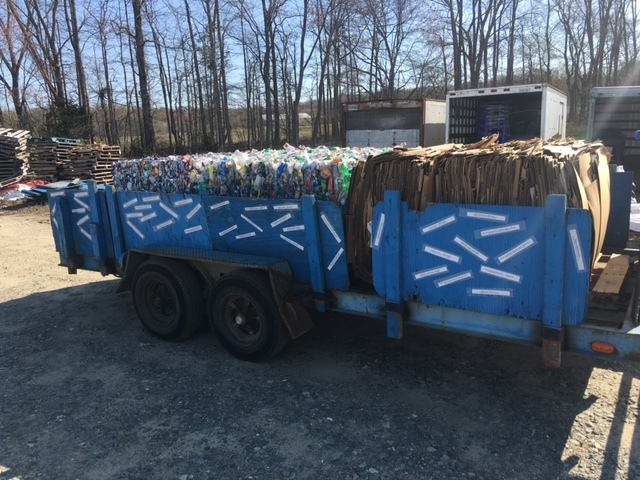 We have had groups from Echo Hill Outdoor School, Chestertown Daisy Troop 330, Eastern Shore County Recycling Coordinators and various small groups or individuals interested in finding out more about what happens to your recycling after it leaves your curb. Most recently we had a visit from Friendship Montessori School and judging by the photos, everyone had fun! 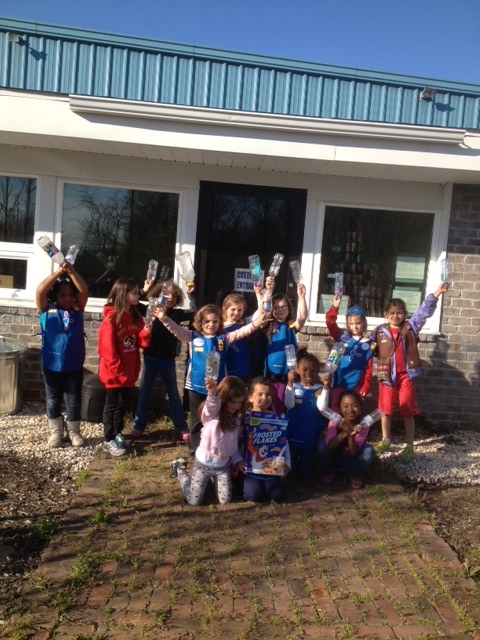 We have representatives from Plastic Free QAC and a group from Clayton School in Delaware coming to visit this month. If you ever wondered what happens once we pick up the recycling, we’d be happy to schedule a tour and answer any questions you have. Ford is our ‘Recycling Guru’ and would love to share his knowledge with you! It was one of the most beautiful Earth Days, weather wise that we’ve had in years. People were lining up to guess the bale weights right from the beginning at 9am. We had three bales out (cardboard, aluminum cans and plastic water & soda bottles. Plus we had a jar of pull tabs for people to guess the number. We printed 100 tickets for each bale and just shy of 90 tickets were used for each bale. We would like to thank the sponsors for the contest. They donated a gift certificate for each contest. Those sponsors are PROCOLINO’S, PLAY IT AGAIN SAM, FIGG’S ORDINARY, and THE SEED HOUSE. Every once in a while we get a double winner and that lucky person this year was Nevin Dawson. Too bad he didn’t try to lottery. Nevin guessed 2556 pull tabs which was 705 too little. The high guess was 5000 by three people and the low guess was 200. And Nevin also won the plastic bale weight with 872 pounds, just 24 pounds over. The high guess was 8 tons (16,000 pounds) and the low was 18 pounds. There was a one pound guess, but we couldn’t take that one seriously. The cardboard bale guess was won by Chris Galt at 1232 pounds, 56 pounds over the actual weight. The cardboard low guess was 15# and the highest guess was 6891#. The aluminum can bale guess by Lydia Burnum was almost perfect, 575 pounds, just 4 pounds too low. The low guess in the category was 25# and the highest guess was 4201#. Thanks for all the participation. Thanks to Chestertown and the Chestertown Environmental Committee for organizing this nice Earth Day Celebration. There were 30 organizations participating. And again thanks to our bale guess sponsors, The Seed House, Procolino’s, Figg’s Ordinary, and Play It Again Sam. 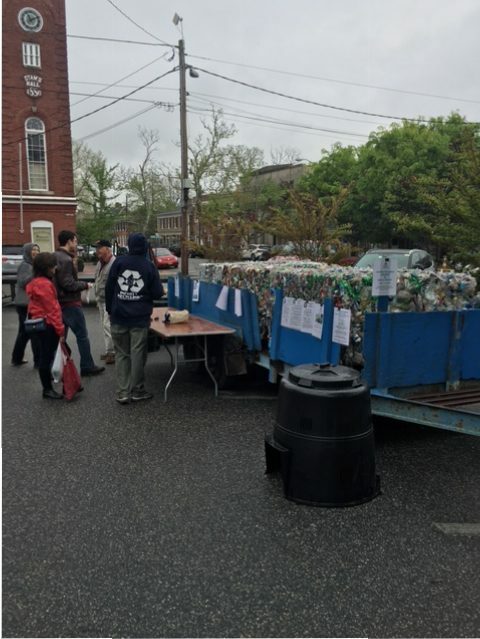 Another cool and drizzly Earth Day celebration in Chestertown, but many people attended, helping us set a record for participation, making us run out of guess tickets before the day was over. We had three different bales, creating three different guess the weight contests. The prizes were gift certificates from our great, local businesses who also recycle, of course. Our thanks goes out to Procolino’s, Play It Again, Sam’s, and a new sponsor and business in town, Figgs Ordinary. 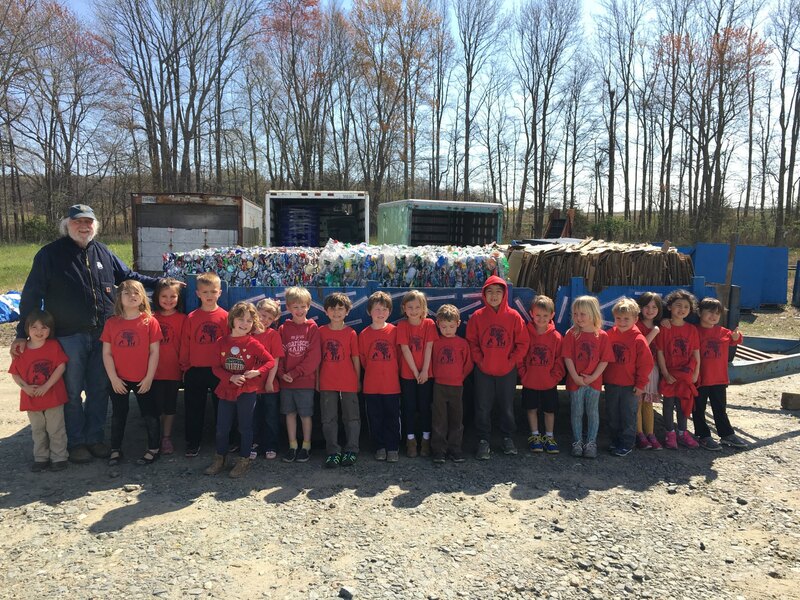 Tague Hurley guessed 842 pounds for the #1 plastic bottle bale which actually weighed 845 pounds. He was only 3 pounds away from perfect! The high and low guesses were 4780# (the same person as the previous high guess) and there was a tie for the low guess at 30#. Mike Foster guessed 1327 pounds for the tin foil bale that actually weighed 1334 pounds. That was another very close guess, missing by only 7 pounds. It was on the heaviest bale on the trailer, almost 503 pounds heavier than the steel can bale! The high and low were pretty extreme at 6000# and 7#. Thanks for all the great participation for Earth Day in Chestertown and thanks again to the prize sponsors, Procolino’s, Play It Again, Sam’s, and Figgs Ordinary. Infinity is very proud to announce that we were chosen as Employer of the Year and were given a Community Certificate of Appreciation at the Class of 2016 Awards Ceremony at The Benedictine School. We would like to send a big THANK YOU to all of the students and staff! It is a pleasure working with you all! It was a cool day, cloudy with a bit of light rain to start. The rain stopped and the sun shone briefly and then it began with a light rain which got a bit heavier around 11:30 and people began to leave followed by many vendors. There were about 20-25 guesses per contest, a low number, about half of the usual. We had three bales and a box of fishing lures that were collected off a beach near Tolchester in one year. 168 lures and the closest guess was 177 won by Doug Gates, just 9 off. The high guess was 500 by Hailey and the low guess was 72 by David L.
The cardboard bale weighed 1403# and was won by Brandon Parks with a guess of 1350#, just 53# off. The high guess was 4000# by Ally Dell and the low was 95# by Lauren Gibson. The aluminum can bale weighed 595# and was won by Barbara Creegan with a guess of 616#, just 21# off. Barbara also guessed the winning weight of our shredded paper bale in 2014, but she tied with four others and was eliminated in the blind draw. It’s good to put down an odd number to avoid those frustrating ties. The high guess was 7836# by Sie and the low guess was 140# by Lauren Gibson. The bales of those big, plastic, poly, woven bags was 962# and was won by Brandon Parks with a guess of 875#, 87# off. This was the second contest that Brandon today; obviously his lucky day! The high guess was 5025# by Kathy Smith and the low guess was 350# by both Ben Sabean and by Catrina..
Our gift certificates were donated by Procolino’s, Evergrain!, Play It Again, Sam, and Lemon Leaf. Many of you may have read the article in the Washington Post recently and many more have had feedback and comments about the article. Please click on the links below to read the full article if you haven’t already, and to read the reactions to the article. Please feel free to visit our Facebook page or email us with any questions, comments or concerns you may have with our services. Basket of Lighters lowest guess was 100, highest guess was 4,500. What a range! The winning guess was Rick Hurley with a guess of 650 which is just 4 off the actual count of 654 lighters! Tin Can Bale lowest guess was 48 pounds, highest was 2,700 pounds. The winning guess was Rich Furneisen with a guess of 1,234 which is 17 pounds off the actual weight of 1,251 pounds. Aluminum Can Bale lowest guess was 75 pounds, highest was 2,800. The winning guess was Jamie Hurley with 57 pounds off of the actual 628 pound bale with a guess of 571 pounds. #1 PET Plastic Bale (Water Bottles & such) lowest guess was 140 pounds, highest was 3,419. The winning guess was 900 pounds by Owen Bailey, 99 off the actual weight of 801 pounds. #2 Natural Plastic Bale (Milk Jugs & such) lowest guess was 60 pounds, highest was 2,300. The winner was Christina Senigen with a guess of 1,200 pounds, 60 pounds off the actual weight of 1,140 pounds. #2 Color Plastic Bale (Laundry Bottles & such) lowest guess was 60 pounds, highest was 4,922. Another big range of guesses! The winner The Reynolds Family, was just 37 off the actual weight of 963 pounds with a guess of 1,000 pounds. We would like to send a special Thank You to Lemon Leaf Caf & JRs Pub, The Kitchen at The Imperial, Evergrain Bread Co., Play It Again Sam, Procolinos Pizza and Uncle Charlies Bistro for their generous donations of the prizes for the winners. 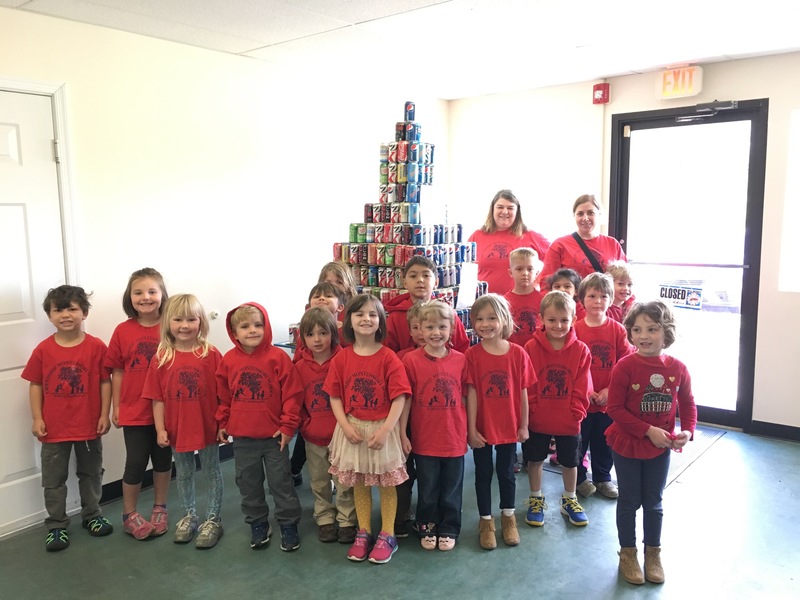 THANK YOU CHESTERTOWN DAISY TROOP 330 FOR YOUR VISIT TO OUR NEW FACILITY! Nicholas Bekker – guessing 627# for the UBC bale which weighed 613#, just 14# off. Chris Taylor – guessing 1350# for the OCC bale which weighed 1374#, just 24# off. Ken Swanson – guessing 900# for the Plastics bale which weighed 895#, just 5# off! Colleen Payne – guessing 1200# for the Paper bale which weighed 1175#, just 25# off. She tied with 3 other people who wrote the same number – Barbara Creegan, Deb Campbell and Press Harding, so we chose the winner by pulling the ticket from a bag. Brook’s Tavern, Uncle Charlie’s Bistro, The Lemon Leaf Café, Play It Again, Sam, and Evergrain! Infinity Recycling has moved its headquarters to the town of Millington after operating almost 25 years on a farm with basic sheds and few walls. Located just off of MD Route 301 at the corner with Millington Road, the new site boasts easy and safe access from the overpass just a half mile south of its facility. The new location comprises a five acre lot with a 14,000 square foot facility in which all our operations can occur. “Our working conditions have improved dramatically including lighting, smooth ground and comfort,” noted founder, Ford Schumann. Once the specially ordered equipment is manufactured, shipped and installed, Infinity Recycling will also be able to offer a dual steam recycling service. Presently its customers are required to set their recyclables out in four to six sorted categories, but once the new system is in place, the recyclables just need to be divided into paper material (newspaper, magazines, writing paper, envelopes, box board, and cardboard) and containers (metal cans, glass and plastic bottles and jars). Infinity will move to dual stream instead of single stream because the preferred system is less expensive, is a good employment fit, and is much more effective in recovering a very high percentage of the material collected. Another local manufacturer, Creafil, located in Worton, buys the paper that Infinity recovers, but Creafil cannot work with that contaminated paper that comes from single stream recycling. “We’re proud that our organization is truly locally orientated. We created a system that serves our community, hires locally, and even sells much of its material locally. We hope to be a prime mover in getting our community to zero waste so our future landfills will be progressively smaller, plus all these resources we recover locally will be creating more jobs locally. The new Infinity Recycling headquarters will offer additional features to serve our area. There will be a lovely nature walk through the boarder woods and around a pond. There will be a backyard compost demonstration area. A CHARM (Center for Hard to Recycle Materials) will be established. And a large conference room will be available for educational displays and meetings. The new address is 31850 Millington Road, Millington, MD 21651 and the new phone number is 410-928-3333.